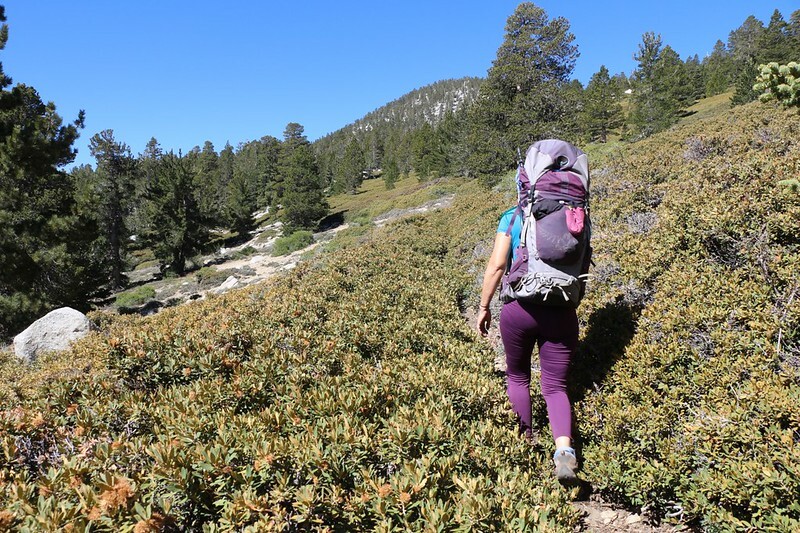 Vicki and I spent Memorial Day Weekend on a four day backpacking trip where we also bagged four of the more obscure peaks in the wilderness: Yale, Harvard, Joyce, and Ellen's. We'd never been to any of them before. And none of them had official names, as far as the USGS is concerned. But we knew better. 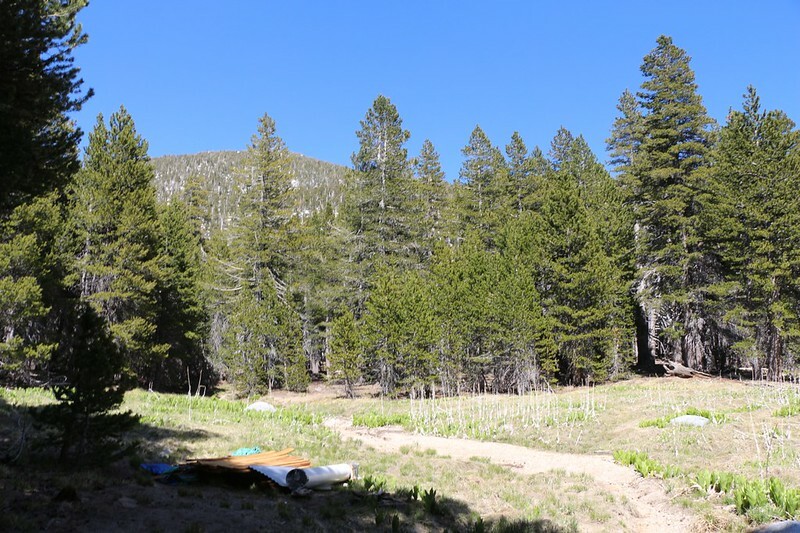 We caught the first Tram up on Saturday morning and headed for our first night's camping spot in Tamarack Valley. We set up camp at the highest campsite (Diorite) which was right next to Cornell Peak. We took a break, then headed out cross-country to the saddle between Yale and Harvard Peaks. 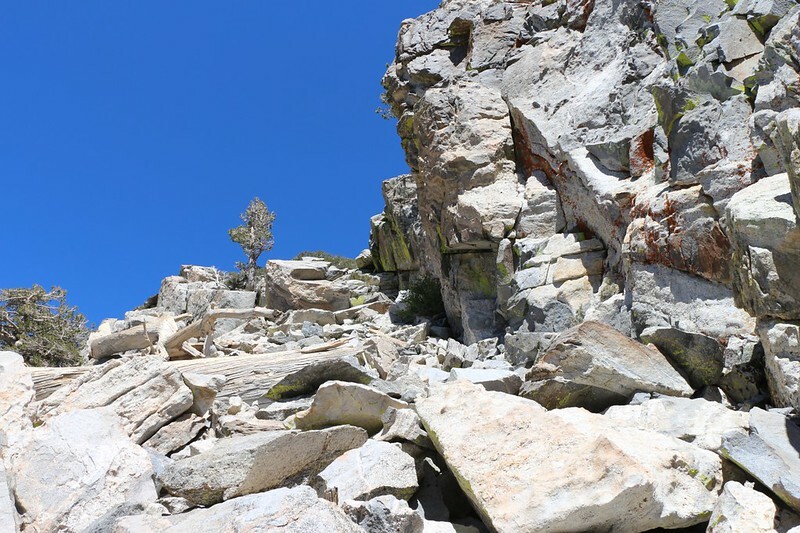 We ate lunch at the saddle, them decided to tackle Yale Peak first. 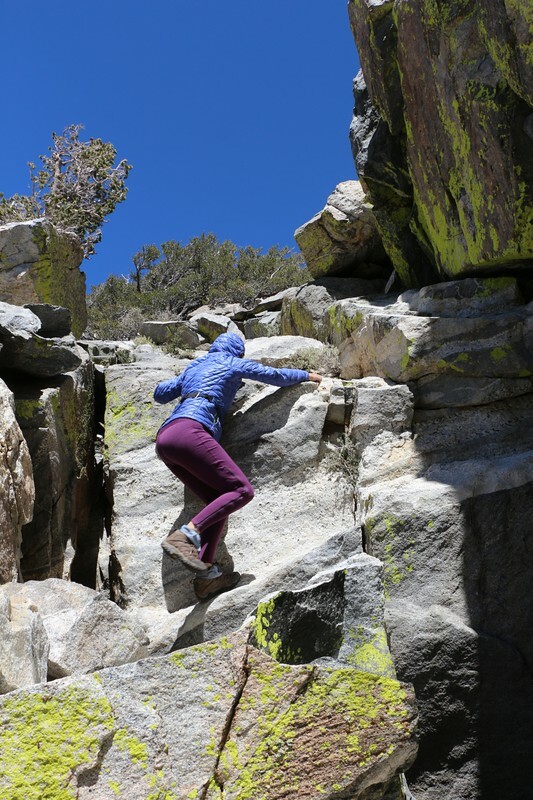 We hung out up there for a little while, then down-climbed the granite chute back to the saddle. 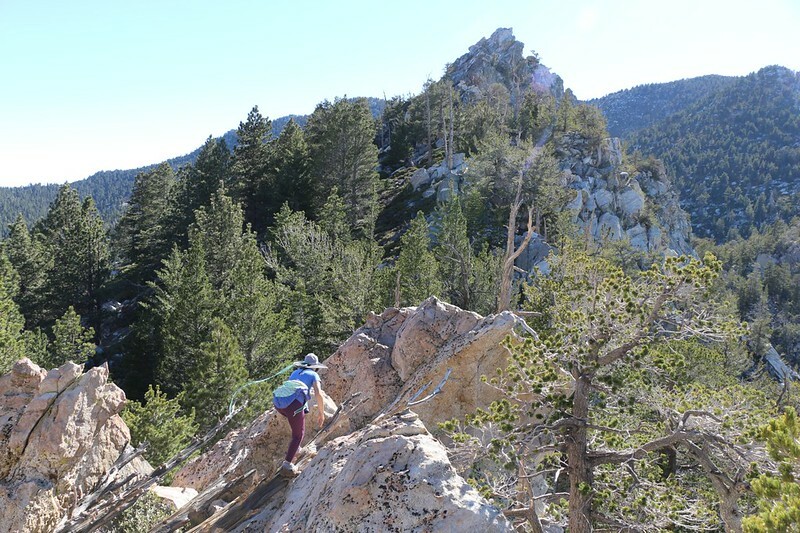 While we were up on Yale, we decided that the best route for Harvard Peak would be to aim a bit to the right of the summit, and then follow the ridgeline to the top. It looked too steep in the middle. And it should be noted that Harvard is quite a bit taller than Yale. We were able to descend from Harvard along the slope of Cornell and ended up dropping directly into our campsite. This made our day-hike a fun loop. We went to bed early because it got quite cold that first night, and it ended up getting down into the thirties by morning. 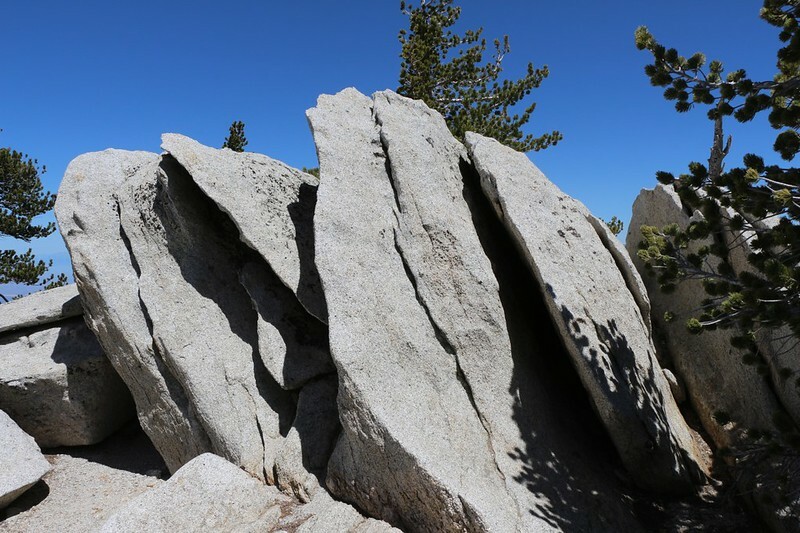 Our camping permit only had us staying for one night at Tamarack, followed by two nights at Little Round Valley, so we packed up camp and headed for the summit. We decided to take the old unmaintained Tamarack Trail. We'd been this way before, but never while carrying full backpacks. Yesterday, I had carried an extra gallon of water because I'd read online that there was little to no water at Round Valley. So that's why we didn't even bother heading that way. The nearest water for us was going to be Bed Springs, so we decided to get it via the shortest route. Panorama shot east from high on the Tamarack Trail. We were the only ones on this trail. The trail joined up with the main trail in the area below Jean Saddle, and we continued uphill with all the rest of the day-hikers. They all passed us as we trudged onward with our heavy loads. 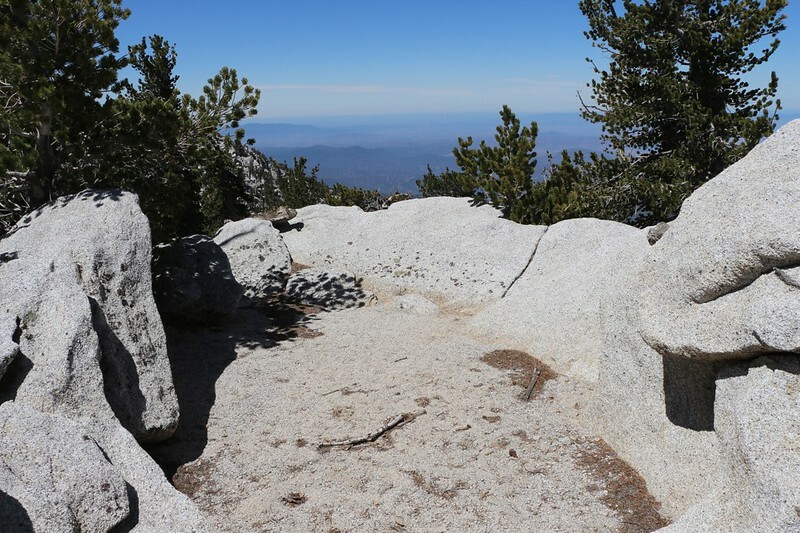 We reached the intersection just below the San Jacinto summit and decided not to bother climbing it. 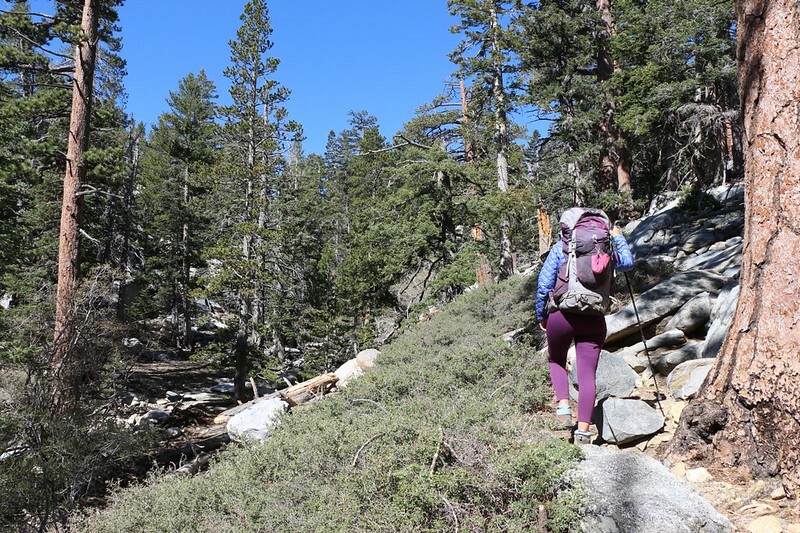 We immediately headed downhill on the Deer Springs Trail and soon arrived in Little Round Valley. We decided to try the "Coopers Nest" campsite and set up our tent. 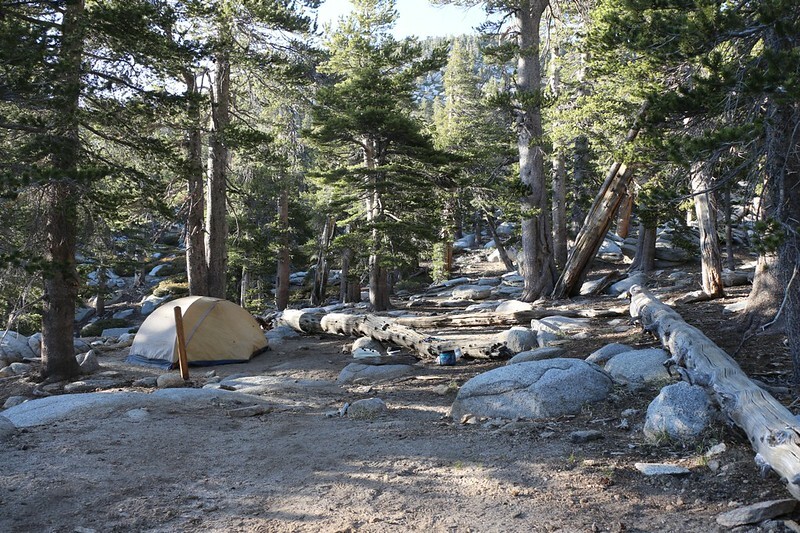 This would be our base camp for tomorrow's excursion to Joyce Peak and Mount St. Ellen's. 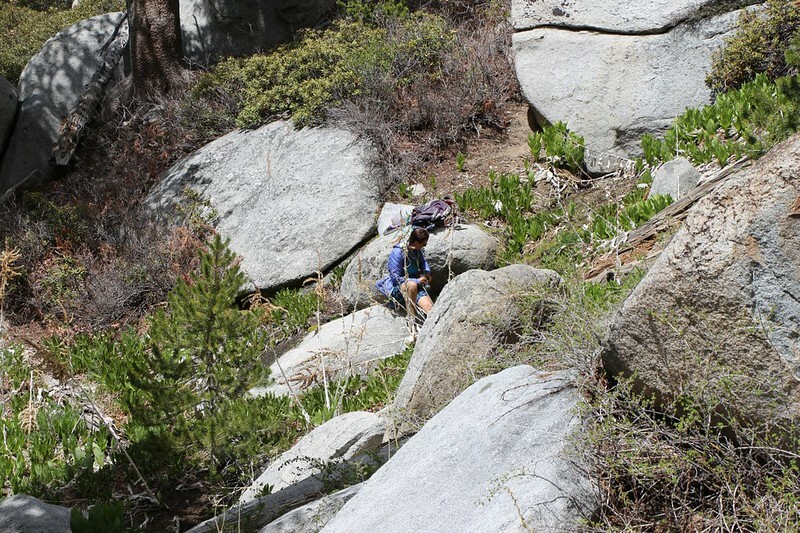 We took a nap, ate some lunch, and headed down the trail to get two day's worth of water. We discovered that all three of the usual streamlets were crossing the Deer Springs Trail, as usual. Usual for May, anyway. We hung around all afternoon. We read our books and sat around in the sun. It was very mellow. But it got cold as the sun went down, so we went to bed early. We stayed in bed late because it was cold that morning. Every time I spend the night in Little Round Valley it gets cold, no matter what time of year. Once the sun hit the tent we got up, ate breakfast, and packed our day-pack. Time to bag more peaks! 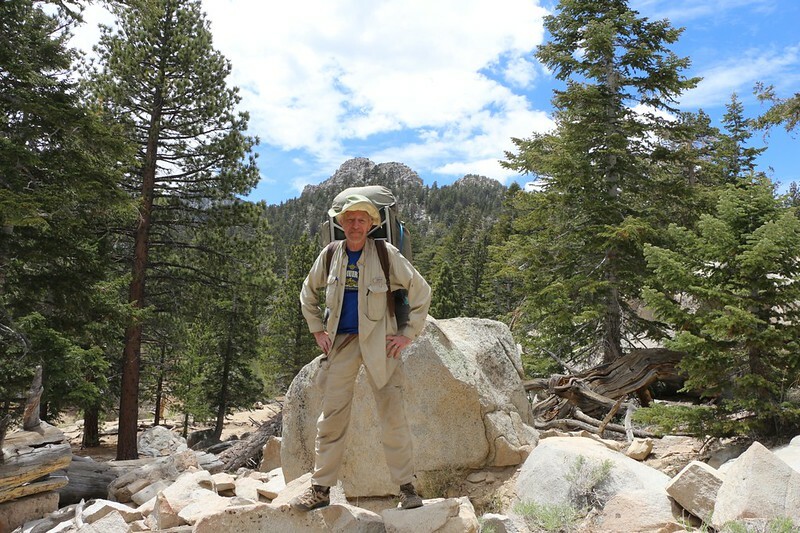 We hiked off-trail up to the saddle next to Newton-Drury Peak and continued south toward Joyce Peak. 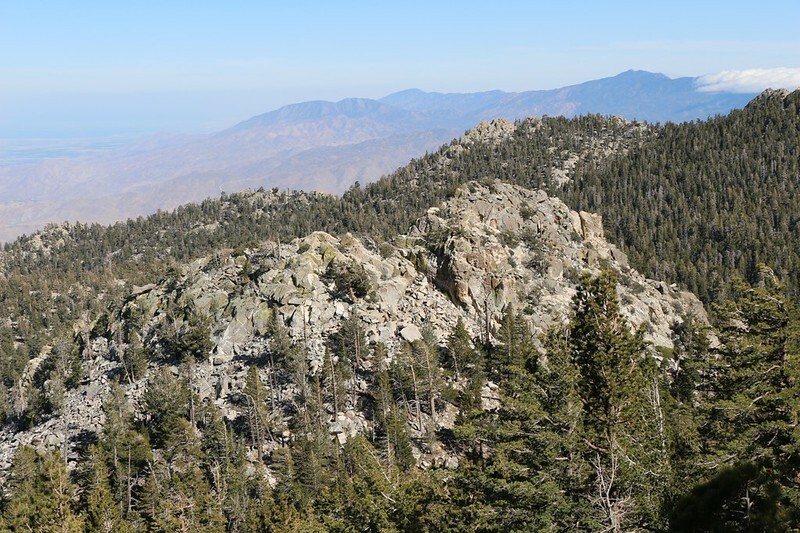 This is great country to hike in, with a pleasant open forest and easy terrain. Joyce Peak would be a great place to camp! But it's not allowed, of course. And there's even water just down the hill at Bed Springs! Not that anyone would ever camp there, naturally. But it sure would be beautiful! We were prepared this time, because we doubted that there would be a register on this peak, so we brought our own. In honor of Joyce, of course! 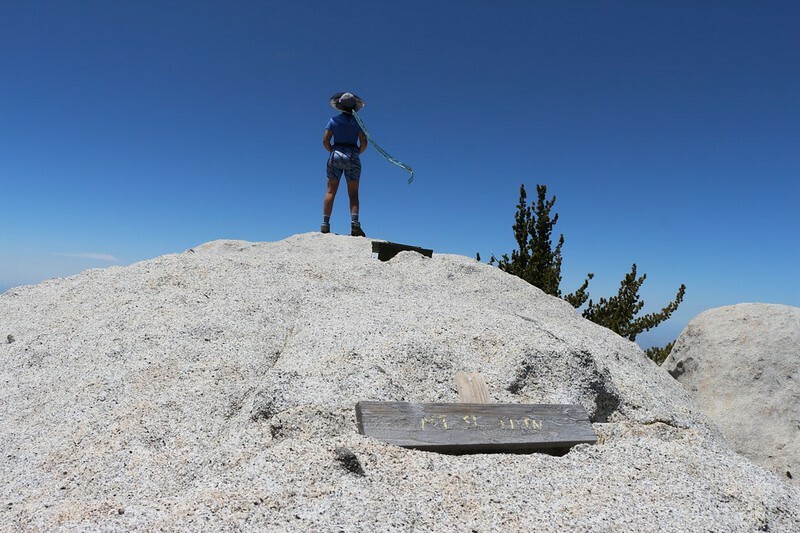 The Joyce Peak (elevation 10160+) summit register is now in place. It has one entry. After that it was time to bag Mount Saint Ellen's. I'd been reading about this peak ever since it was dedicated, and I've been wanting to get up there for quite some time now. The lettering on the sign is starting to show some serious weathering, but the summit register was in perfect shape. The final signature was from last November, when Ellen and friends made the journey. Hi Ellen! It was fun to read the dedication and to look through all the photos. Thanks! After that, we decided to be sleuths and scope out the mystery of Bed Springs. 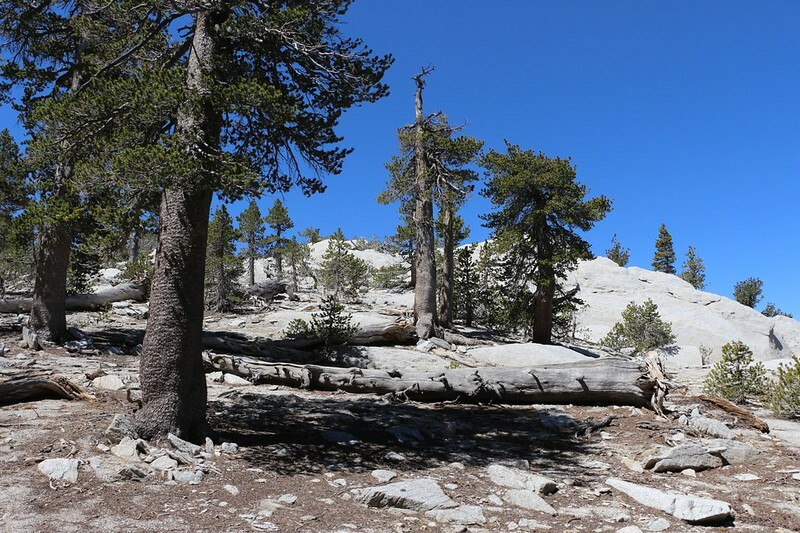 We hiked past the Joyce Peak Ridge and headed down into the Bed Springs Valley, where we followed a small dry watercourse. Eventually we spied some green ahead. As we approached we saw plenty of gooseberry plants near the confluence of two small valleys. And there was water. And the Bed Springs themselves! 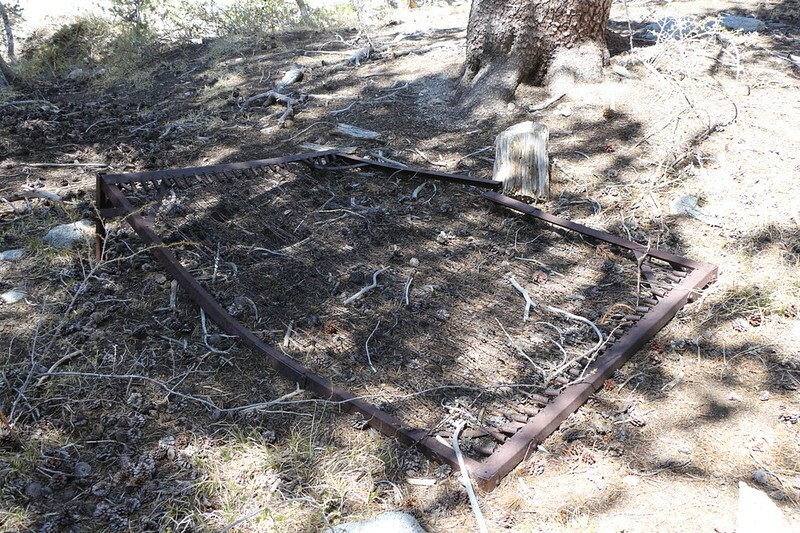 There was also an old fireplace and other camp refuse/residue. All in all, this was also a pretty nice spot to camp, but it certainly didn't have the views like up on Joyce Peak. The mystery wasn't truly solved, unfortunately. Finding this place only made us ask more questions. 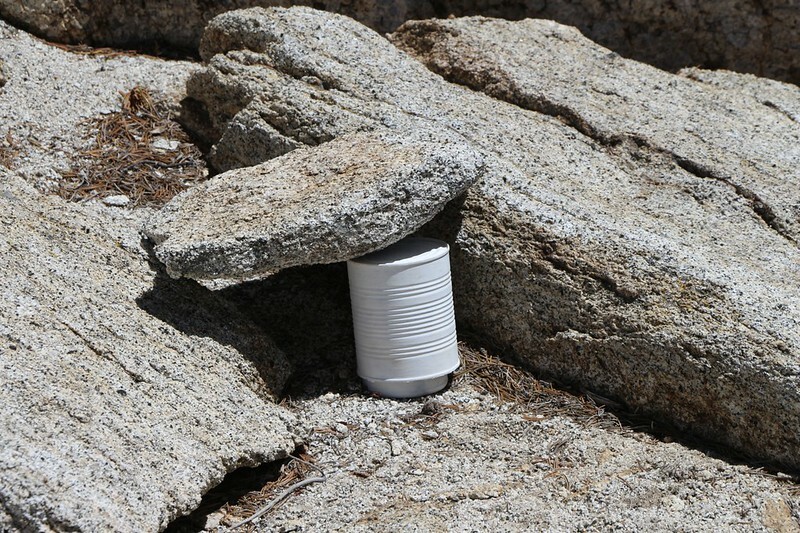 Who carried this stuff up here? And when? How long did they stay? What were they doing here? Why did they leave? Maybe some elderly resident of Idyllwild or Pine Cove knows the answer. But maybe no one knows now. Mysterious doings in the forest. After that, we hiked all the way down the streambed until we reached the Deer Springs Trail, and then climbed back up the hill to camp. 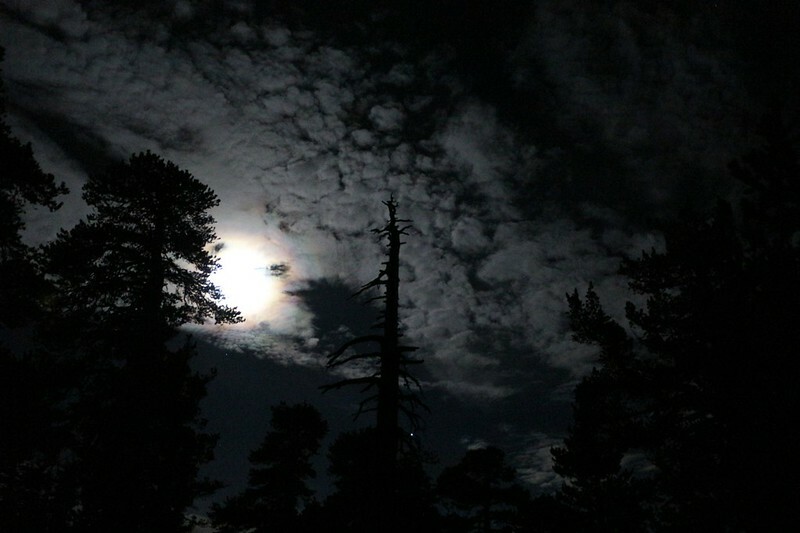 I woke up at 3am to see rainbow fog around the Full Moon. Then I went back to bed. The weather had warmed a bit over the past few days, and even though it was still cold we woke up at dawn and got ready to hike out. It was Tuesday after Memorial Day, and we knew we'd have the mountain and the trails mostly to ourselves as we hiked back up and over on our way back to the tram. And, no, we didn't feel like hiking all that way downhill to Strawberry Camp to make it a big loop. That was too much work with full packs. 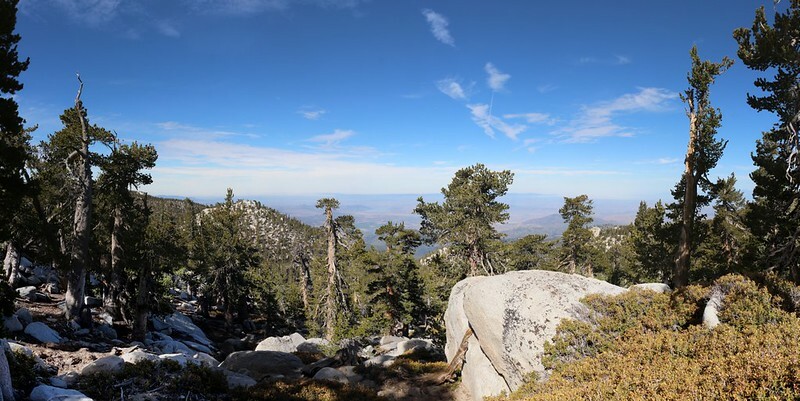 Even though we'd planned to bag the San Jacinto Peak summit that day, we ended up wimping out. We mostly just wanted to get back to civilization and eat some decent food. 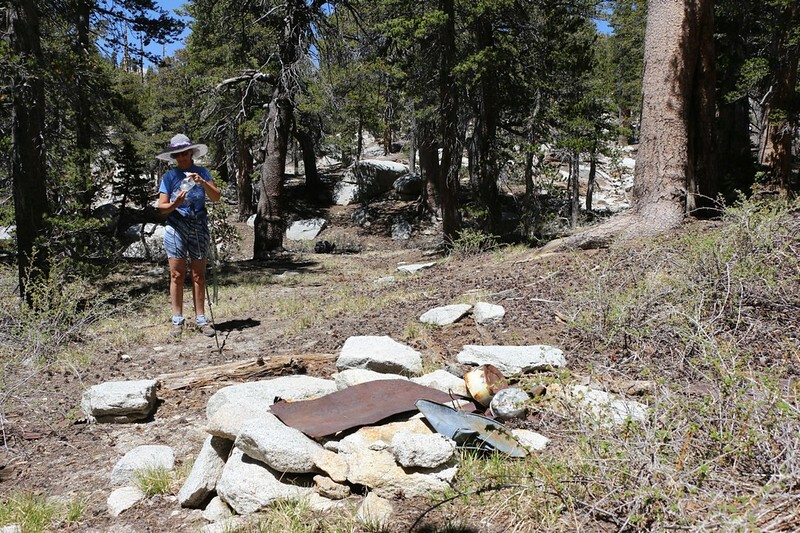 So we headed on down the main trail toward Wellman Divide and Round Valley. We went by Round Valley and saw that the spring was flowing just fine. A bit slow, perhaps, but steady. I was a bit sad that I'd carried that gallon with me the first day, but not totally sad. It had ended up working out just fine for us anyway. We also noticed that there were many pools of water in the creek below Round Valley, so even if the spring failed there was still plenty of water. Later on this season it will dry up, as usual, but for now it was OK.
We arrived back at the station just in time to board a tram car. 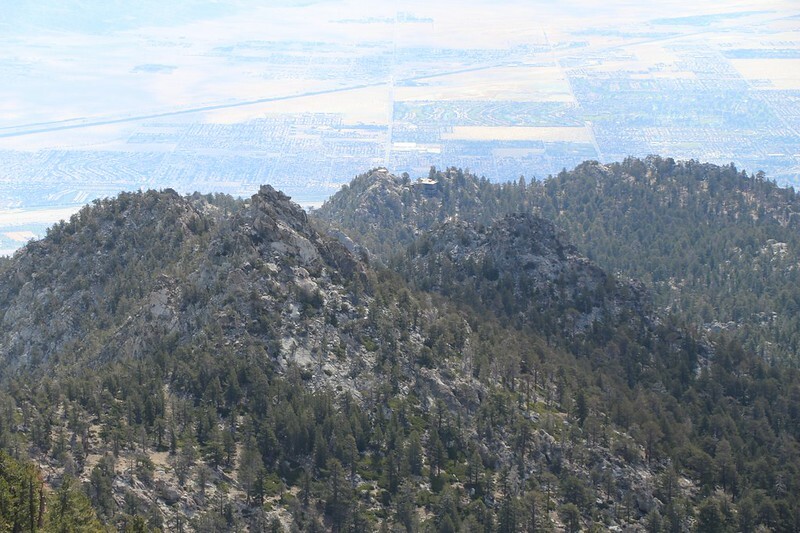 The air got hotter and hotter as we descended, and it ended up being over 100 degrees in Palm Springs that day. But we didn't care as we ate a hearty lunch inside an air conditioned restaurant! Last edited by jfr on Thu Jun 14, 2018 5:30 pm, edited 1 time in total. It sounds like a great trip. The high country where you spent your days is so peaceful and beautiful. 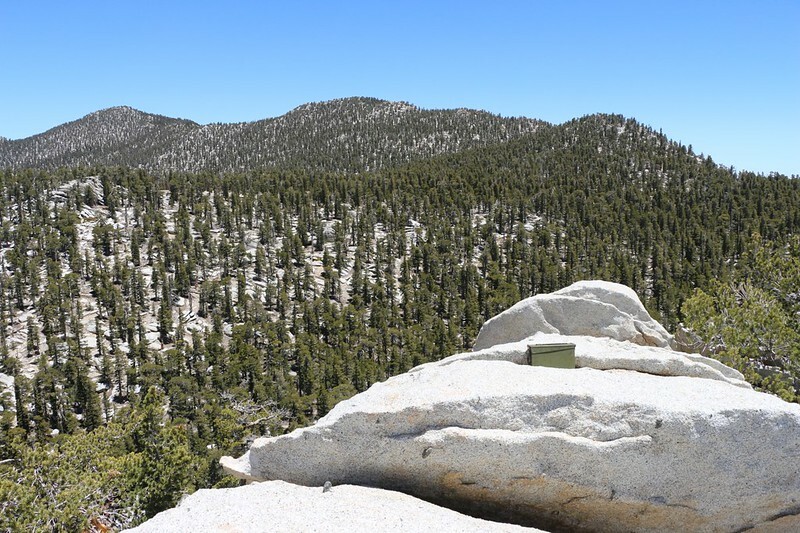 I imagine you saw few, if any, other hikers up there other than on the trails and in the camping areas. Great TR jfr, well documented & photos. I'm in in that area a lot, (except for the area west & south), and love it, peaceful & few folks, as Wildhorse mentioned. I've only been around the open, lightly forested area you spoke of a couple times, but see it from San Jac, and thought it looks like great cross-country area. That's for the water update, I really thought the RV spigot would be gone by now. I do by Diorite cs often, and like the elevated perch it offers. 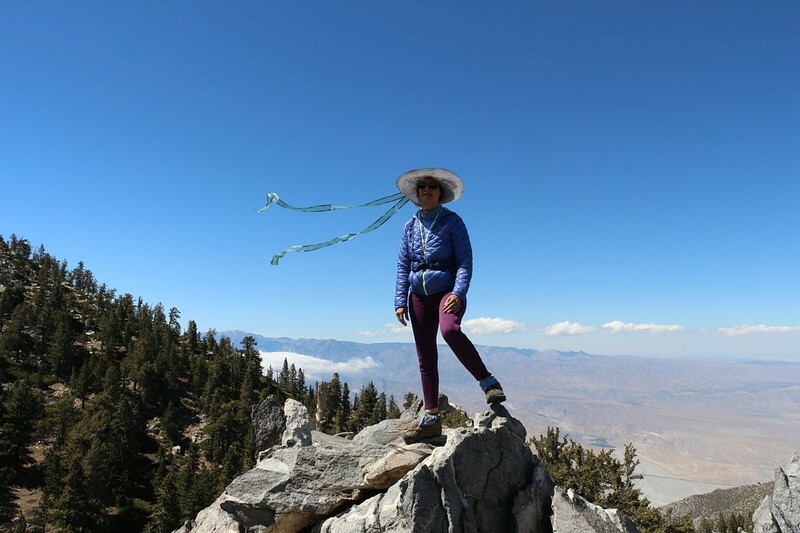 Thanks so much for the fabulous TR and photos -- I felt like I was hiking along with you and Vicki I love going XC on the west side of the San Jacinto wilderness. Thanks for the great report. I haven't seen much beta on Harvard and Yale. Between Newton-Drury and Marion/Ellens is one of the most beautiful areas I've seen anywhere. Your report really made me want to go back. I can still smell the trees.